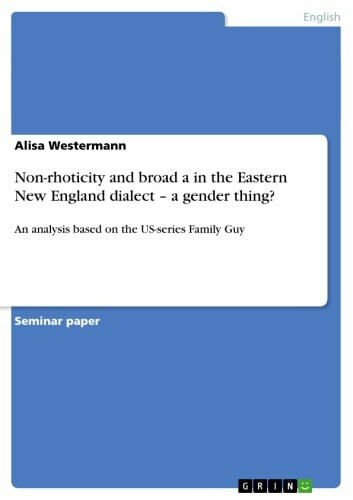 Seminar paper from the year 2009 in the subject English Language and Literature Studies - Linguistics, grade: 1,7, University of Münster (Englisches Seminar), course: American English, language: English, abstract: This paper describes an analysis of the Eastern New England dialect with concentration on the features of non-rhoticity and broad a. It examines the results by comparing the speakers' levels of non-rhoticity and broad a to the factor of their gender. On the one hand, I decided to examine the features of non-rhoticity and broad a, because these features are most prominent for this particular dialect of American English. 'Two major New England shibboleths are the 'dropping' of post-vocalic r(as in [ka:] car and [ba:n] barn) and the low central vowel [??] in the BATH class, words like aunt and glass.' (Carver, 1987: 21) On the other hand, I have recognized that there is a lack of examination of the mentioned features especially with regard to the speakers' gender and if these results would be conform with the sociolinguistic statement of women showing a stronger tendency towards standard or prestige variants in their speech communities. (Schönweitz, 2001: 2) As the basis of this analysis I decided to use speech data of the two main characters of the American television series Family Guy, which is known for being presented in the typical Eastern New England (ENE) dialect. The structure of my paper is divided into the following sections: an overview of the topic as well as the two features under examination, a description of the methodology used in this study and a section of the results which will take a look at my findings. Afterwards, a conclusion follows with implications on further research. Books related to Non-rhoticity and broad a in the Eastern New England dialect - a gender thing? The Myers-Briggs Type Indicator. Science or Pseudo-Science?